Few things bring me greater joy than entertaining family and friends around my kitchen table. Easter Sunday was such an occasion. I hosted dinner for my parents and sweet in-laws, plus my husband’s beloved Aunt Polly. 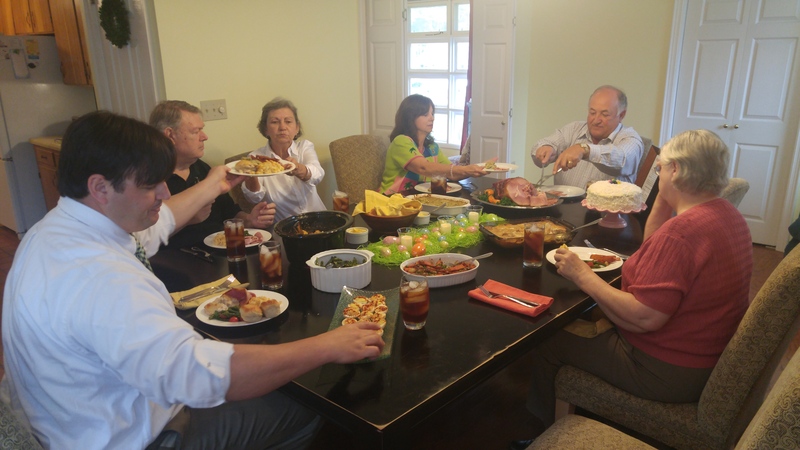 From Ina Garten’s Coconut Cake to deviled eggs and brown sugar-mustard glazed ham, our celebratory feast was Some Kinda Good, and as Southern and traditional as it gets. Though our Smithfield Spiral Ham, with its crispy exterior and sweet, smoky flavor, lived up to all our expectations, the real star and workhorse ingredient of our meal was honey. Used in the glaze for the ham, the homemade dressing for the green bean and cherry tomato salad, the compound butter for the brown and serve rolls and in my Honey Glazed Carrots and Onions, we couldn’t have created Easter dinner without it. Hats off to you, sweet stuff. I am in my element glazing our Easter ham. I still get a new Easter dress every year! For me, every aspect of hosting a meal, including menu planning, choosing the festive centerpieces and displaying all my good platters and servingware is so much fun. On Easter Sunday, I placed green Easter basket “grass” in the center of my black, distressed Pottery Barn table and topped it with pastel eggs of various sizes and flickering votive candles. I even filled a few of the eggs with treats (jelly beans and Reese’s Peanut Butter Cups!) for a fun “hunt” at the end of the meal. Adults like to play, too! My bright coral and yellow cotton cloth napkins atop our white bone china made for a colorful table setting and served as the perfect ode to spring. When I plan a menu, I consider the colors of each dish and how they present on a plate, along with the temperature of the food. Serving too many casseroles or dishes that are all hot or all cold won’t provide much variety or any surprises for the palate. Also, considering dishes you can make on the stovetop or in a slow cooker versus in the oven will help maximize space, which is especially important when getting dinner on the table in a timely fashion. Adding unexpected touches, such as a printed menu in a nice picture frame keeps guests on their toes. Any dishes you can prepare in advance or prep work you can do the night before guests arrive decreases your stress level on the big day. For instance, I peeled and sliced all my carrots, chopped the ends off my fresh green beans and sliced my cherry tomatoes on Easter Eve. Preparing these dishes in advance allowed me to spend more time socializing with family instead of slaving away in the kitchen. When entertaining for any special occasion, changing up where you eat different courses of the meal keeps things fresh and allows the party to flow naturally. After enjoying the main course in the formal dining room, dessert was served with coffee in the casual living area. Here’s a snapshot of our dinner menu, followed by a slideshow of the food. Crisp, bright orange carrots, a cold green bean and cherry tomato salad, succulent fall-off-the-bone spiral ham and creamy mac & cheese (in a slow cooker!) made the meal one to remember. Of all the dishes I prepared, the best decision I made was adding Slow Cooker Mac & Cheese with Bacon to my list of side dishes to serve. This Taste of Home recipe is out of this world! I made it in advance by completing the directions in Step 1 up until cook time. I placed my slow cooker in the refrigerator until the next morning when I was ready to cook the dish. Adding bacon to the recipe was my idea. I cooked four slices on a baking sheet, then crumbled them and added them on top with a bit of fresh parsley for effect. Cook macaroni according to package directions; drain. Place in a 5-qt. slow cooker; add butter. In a large bowl, mix 3 cups cheese, evaporated milk, condensed soup, 2% milk and eggs. Pour over macaroni mixture; stir to combine. Cook, covered, on low 3-1/2 to 4 hours or until a thermometer reads at least 160°. Sprinkle with remaining cheese. Cook, covered, on low 15-20 minutes longer or until cheese is melted. Sprinkle with paprika. Add bacon and parsley. Yield: 10 servings. Let me know if you’d like any of the other recipes featured in this post. How was your Easter Sunday? Did you eat a traditional meal or opt for a more non-traditional route? I’d love to hear about what you cooked or ate in the comments below. At any rate, JESUS IS RISEN and that’s something to celebrate! Georgia native Rebekah Faulk Lingenfelser is a freelance writer, entertainer and food enthusiast who writes and speaks about her love of good food and the Coastal South. A Season 2 Contestant on ABC’s “The Taste,” she is the Statesboro Herald food columnist and host of SKG-TV on YouTube. A public relations graduate of Georgia Southern University, Rebekah also attended Savannah Technical College’s Culinary Institute of Savannah. Visit RebekahFaulk.wix.com/RebekahFaulk or connect with her on social media by following Some Kinda Good on Facebook, Twitter and Instagram.